The pressure to achieve more, do more, and be more is part of being human – and in the age of Adderall and Ritalin, achieving that can be as close as the local pharmacy. No longer just “a cure for excitable kids,” prescription stimulants are in college classrooms, on Wall Street, in Silicon Valley…any place “the need to succeed” slams into “not enough hours in the day.” But there are costs. In the insightful Netflix documentary Take Your Pills, award-winning documentarian Alison Klayman (Ai Weiwei: Never Sorry) focuses on the history, the facts, and the pervasiveness of cognitive-enhancement drugs in our amped-up era of late-stage-capitalism. 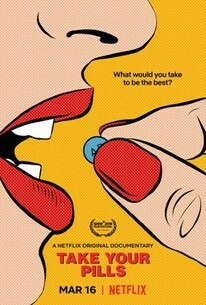 Executive produced by Maria Shriver and Christina Schwarzenegger, Take Your Pills examines what some view as a brave new world of limitless possibilities, and others see as a sped-up ride down a synaptic slippery slope, as these pills have become the defining drug of a generation.